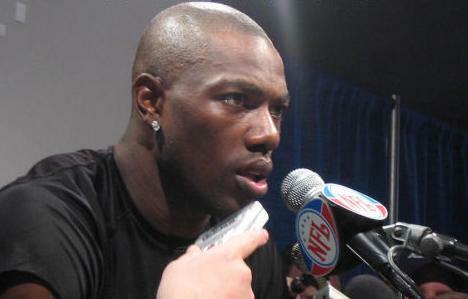 IRVING, TX – On Monday, Dallas Cowboys wide receiver Terrell Owens assembled reporters and various media members to chastise them on the coverage, or lack thereof, he has been getting. “I shouldn’t have to do this” started the obviously irritated Owens. “It’s really kind of embarrassing that you all have put me in this position” said the 6-time All-Pro. Owens continued on with a 9-minute diatribe that went something like this: “Blah, blah, blah…me, me, me…blah, blah…look at me, look at me”. He also condemned the media over the amount of exposure that new teammate Adam ‘Pac-Man’ Jones is receiving, saying that Cowboys owner Jerry Jones “promised” that Pac-Man wouldn’t take any publicity away from Owens. “He promised!” pouted Owens with his arms folded and bottom lip stuck out. Before stomping away Owens said that if this downturn in public attention continued that he would be forced to fire his press secretary and that it would be all our fault and he also muttered something about changing his name to Terrell Ocho Uno. 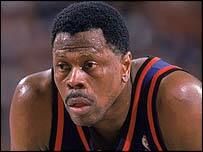 NEW YORK- On Wednesday, former New York Knicks All-Star Patrick Ewing filed for a restraining order against famed anthropologist and primatologist Jane Goodall. Ewing reported that Goodall has been stalking him for the past 6 weeks. Ewing said that he caught Goodall hiding in the bushes of his Connecticut home on Sunday, and that was the last straw. “I ran out back, waving my arms in the air and yelling” reported Ewing, “but she just averted eye contact and remained motionless”. The ex-NBAer also reported that not only has she been at his residence, but that she has been following him around town as well. Said Ewing “I went to the Piggly Wiggly to grab a few things, and there she was, over in produce, squatted down beside the bananas, watching me and writing in her notebook”. Attempts to contact Goodall have been unsuccessful. Assistants at the Jane Goodall Institute for Wildlife Research stated that Dr. Goodall was away on a field study and wasn’t expected to return for a couple of weeks. 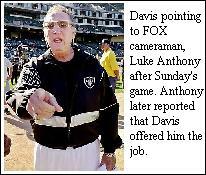 OAKLAND, CA — Speaking via telephone, Oakland Raiders owner Al Davis said now that former head coach Lane Kiffin is gone, he can focus on and looks forward to firing his replacement.